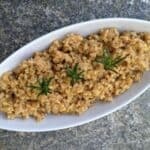 This recipe is my favorite salad. And that’s quite a compliment coming from a carb-loving chocoholic. The secret is all the contrasting flavors and textures. The tangerines are sweet, and the white beets are savory. The avocado is smooth, and the pine nuts are crunchy. Even the aged balsamic vinegar and basil olive oil each have a balance of tang and sweetness. All these contrasts in one bite just make me want to say “wow.” This interesting combination will add excitement to any winter dinner table. Now let’s talk ingredients. I never tried white beets until I subscribed to our school’s CSA (community-supported agriculture) produce box. These beets taste nothing like red beets, which I find too “earthy” tasting. White beets have a more mild, clean taste and are beautifully complimented by a sprinkle of dried thyme. Your best chance of finding white beets is at a farmers’ market. Otherwise, substitute another root like baby turnips. I am so in love with white beets, that I am going to plant some in my yard. I found seeds at Burpee’s online. 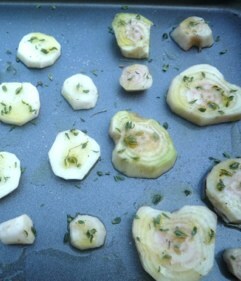 In the winter, I like to roast white beets along with many other root vegetables. I tend to serve the other roots immediately while warm and save the white beets for this salad on the following night. Once the beets are ready, the salad comes together very quickly. 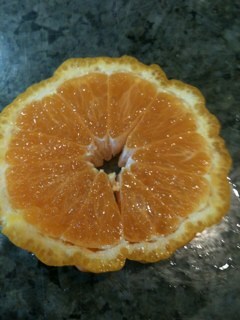 My other new love from the CSA box is Golden Nugget tangerines. Inside the wrinkly, ugly exterior, is the sweet and juicy flesh. 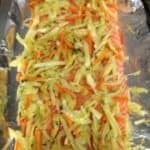 Golden Nuggets peel and segment easily and have thin membranes, which is perfect for this salad. Tonight I used clementine tangerines in the salad which were incredibly sweet and much easier to find in the supermarket. The Calivirgin brand basil olive oil and aged, thick balsamic vinegar take this salad to a whole new level. 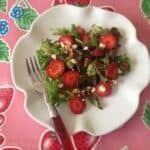 Now, I’m not one to buy specialty ingredients that get used for just one recipe, but if you are like me, once you taste these products, you will want to put then on every salad and most anything else: chicken, fish, vegetables, strawberries, pears, and just everything. The basil olive oil is sweet with a smooth, velvety texture. The aged balsamic vinegar is sweet and tangy all at once. I don’t find the need to emulsify the two together. I just pour them both over the top of the salad and toss. It doesn’t get any easier or more delicious. 4 cups of mixed baby lettuce, washed and dried. 1 small California avocado, peeled and diced. Preheat the oven to 400 degrees. Trim the top and skinny bottom off of the beets. Peel, rinse, and dry. Slice the beets into circles about 1/2″ thick. Lightly coat the beets in plain olive oil. Spread the beets in a single layer on a nonstick baking sheet. Sprinkle with thyme, salt and pepper. Roast for about 20 minutes or until fork tender. Let cool. Cut each circle in half, and set aside for the salad. The beets can be roasted ahead. Slice the tangerine into circles. 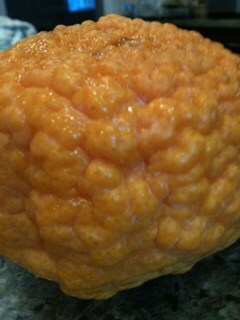 Start by slicing off the rind at the top and bottom of the tangerine, and discard the rind. Take the remaining tangerine and slice it into 3 circles, each about 1/2″ in thickness. Peel off and discard the rind around the perimeter of the circles. 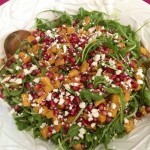 Divide each circle into triangular segments and set tangerine pieces aside for the salad. 3. 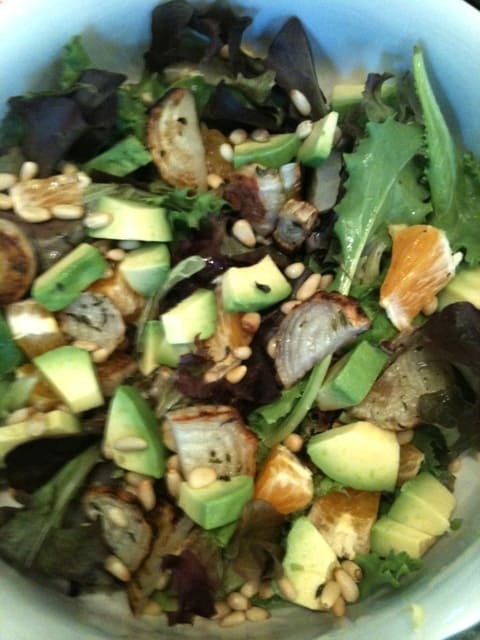 In a salad serving bowl, put in the lettuce, roasted beets, segmented tangerines, avocado, and pinenuts. Drizzle salad with basil olive oil and aged balsamic vinegar. Lightly sprinkle with salt and pepper. Toss and serve immediately. For more avocado recipes, join Dine & Dash and Cookin’ Canuck for the California Avocado 4th of July Blast, sponsored by the California Avocado Commission. I can see why this is your favorite salad…it’s full of so many great flavors and textures! Beets and avocados? Yum! I’ve never seen those Golden Nugget tangerines before! We have Satsuma and Tango on our ranch….along with all the avocados. Beautiful salad! Love all the variety. 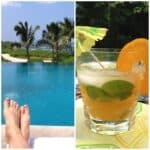 Looking forward to meeting you at Camp Blogaway!